Director and playwright Happy Ranajita��s exploration of the problems faced by Indiaa��s gay community, A Straight Proposal, goes on tour for the first time since making its debut in Delhi, fitting in two shows at Ranga Shankara before heading on to Mumbai and Goa. The play follows the life of school teacher Mitesh, with the action taking place between India and New York. Adopting a non-linear structure, each scene corresponds to a page from a charactera��s diary, highlighting a significant day in the history of the LGBT movement, with the diarya��s page number referring to articles in the Indian Penal Code. 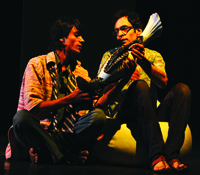 While the script was written before section 377 was reinvoked in December 2013, it was this event that provided the impetus for Ranajit to put the play on stage. a�?Ia��d first written about these issues in 2008, after the death of a close friend,a�? the director shares. a�?Despite the fact that his male partner took care of him in his last days, that partner was not allowed to come for the last rites.a�? But funding was not forthcoming, and the project was rejected by several organisations. a�?After December 2013, I became determined that my artistic expression would not be stifled. So I put my own money into the production, and luckily, the audience response was phenomenal, and wea��ve been able to carry on,a�? he elaborates. Realising that people are generally more open to the LGBT community in metro cities, Ranajita��s play hones in on a boy from small-town India. a�?The protagonist is a common man a�� the sort you can see on the streets of any small town. He struggles to find love because of societya��s morals and norms,a�? Ranajit explains. Expecting a positive response in the city, the director hopes that the play will raise awareness. a�?Those who watch the play will at least realise that the whole world is not straight. I want a straight audience to watch it and queer audience to love it,a�? he signs off.